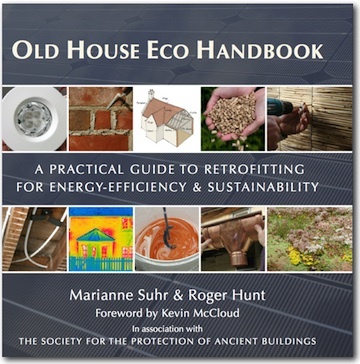 Old House Eco Handbook, A Practical Guide To Retrofitting For Energy-Efficiency & Sustainability by Roger Hunt and Marianne Suhr, with a foreword by Kevin McCloud, is published by Frances Lincoln in association with the Society for the Protection of Ancient Buildings. It is a companion to the authors’ highly successful Old House Handbook. With rising energy bills and the wish to cut carbon emissions high on many people’s personal agenda, the need for sustainable, energy-efficient buildings is increasingly urgent. Old House Eco Handbook shows homeowners, architects and builders how to make houses – be they medieval and timber-framed, Georgian, Victorian or Edwardian – energy-efficient and low carbon without devaluing future sustainability or character. Old House Eco Handbook builds on the essential repair philosophy described in Old House Handbook. In the rush to be ‘eco’, compatibility between traditional buildings and modern technologies and materials can be easily ignored. This is a potentially huge mistake, with far reaching consequences. In their new book, the authors consider the knock-on effects of eco improvements to a building in relation to everything, from improved airtightness and thermal insulation to the installation of solar panels. By examining the potential impact of these changes, Old House Eco Handbook aims to provide practical solutions for all who care for old buildings, helping to safeguard the future of our built heritage. ROGER HUNT, co-author (with Marianne Suhr) of Old House Handbook, is an award-winning writer and blogger with a particular interest in sustainable and vernacular architecture and the materials and techniques used in construction. He is the author of Rural Britain: Then and Now, a celebration of the British countryside, Villages of England and Hidden Depths, an archaeological exploration of Surrey’s past. He lectures on building-related issues, is a judge of annual awards for new housing and serves on the editorial board of the SPAB magazine. His latest renovation project is a 1900 house on Martha’s Vineyard, Massachusetts, USA. MARIANNE SUHR is a Chartered Building Surveyor specialising in the repair of historic buildings. After completing a scholarship with the SPAB she worked for seven years in architectural practice, then full-time on hands-on repair projects including three very different old houses. For the SPAB she has run over 40 homeowners’ courses and numerous ‘limedays’. She is co-author (with Roger Hunt) of Old House Handbook, and has written and lectured extensively. A co-presenter of three series of BBC2's Restoration, she recently set up the Old House Consultancy, advising on repairs and alterations in Oxfordshire. THE SOCIETY FOR PROTECTION OF ANCIENT BUILDINGS was founded by William Morris in 1877 to counteract the highly destructive ‘restoration’ of medieval buildings being practised by many Victorian architects. Today it is the largest, oldest and most technically expert national pressure group fighting to save old buildings from decay, demolition and damage. Members include many leading conservation practitioners, homeowners living in houses spanning all historical periods and those who simply care about old buildings.